The Flats at 124 Alfred, a development offering affordable housing to residents who are 55 years old and older, has been completed in Detroit’s Brush Park neighborhood. The building is part of Detroit-based Bedrock’s 8.4-acre City Modern development, and is one of six planned apartment buildings. City Modern will encompass four existing Victorian mansions and 20 new buildings. When combined, the buildings will result in five different building types – townhomes, carriage homes, duplettes, historic homes, and flats. They will offer 410 contemporary residential units, 285 of which are available for lease. 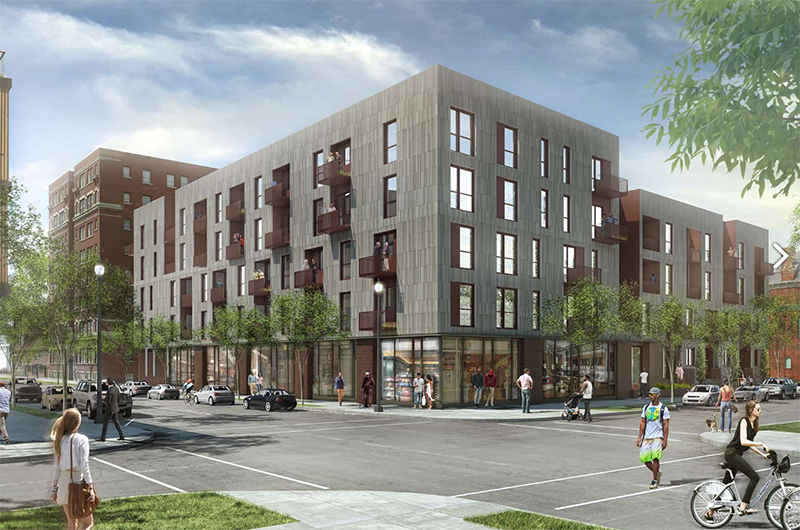 The blend of architecture is meant to reflect the style and diversity of Brush Park. The Flats at 124 Alfred, located north of Comerica Park, offers 54 apartments for lease. One-bedroom units range from 600-735 square feet and include floor-to-ceiling windows, walk-in closets, and energy efficient, stainless steel appliances. The complex has a fitness center, a residential lounge, an outdoor terrace, an outdoor garden spaces, bike share, gated underground parking, and high-speed internet. The units are open to residents who earn 30 to 60 percent of the area median income, or $14,910-$29,820 for a single person. The building was designed by Detroit’s Hamilton Anderson Associates. Bedrock committed in 2017 to make 20 percent of its residential portfolio affordable. The company plans to develop or rehabilitate up to 3,500 residential rental units over the next several years, and 700 of these will be affordable. Bedrock is a full-service real estate firm specializing in acquiring, developing, leasing, financing, and managing commercial and residential buildings. Since it was founded in 2011, Bedrock and its affiliates have invested and committed more than $5.6 billion to acquiring and developing more than 100 properties. Its portfolio consists of 210 office tenants and 125 retailers and restaurants in Detroit.